To celebrate the coming New Year, I have decided to hold another giveaway! This time I am giving away one brand new bottle of the highly coveted NARS Zulu. This is a bottle of the new release Zulu that came out earlier in 2010. I haven't had the chance to do swatches of this polish yet, but you can check out some awesome pics of this hot lacquer here and here. 2. Leave a comment with your follower name and email. 5. Giveaway closes on 20th January 2011. 6. The giveaway is open internationally. Please include all info in one comment only. 2011 is set to be a massive year for me so I'm super excited for it to arrive! I hope the New Year brings you happiness, success and love! I hope you all had a fantastic Christmas! Mine was a little hectic as we had to visit three lots of family, but all in all I had a lovely Christmas. I was also a very lucky girl and was given a new camera! Say hello to my new Canon DSLR! 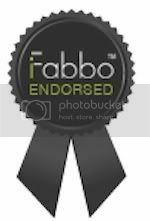 This means no more crappy swatch photos! However, it also means I am going to have to look after my cuticles better (as you will see from the photos below!). Apologies in advance for the horrible cuticles! :s Please also excuse the nubbins. I had a killer break on my middle finger a couple of days ago so I had to file them all down *cries*. Today I have swatches of three of the new colours from Essie's Winter 2010 collection. The collection consists of 6 chic and elegant wintery colours. Even though it is summer here in Oz, the colours are so gorgeous, I will definitely be wearing them! And the naughty blogger award goes to......... ME! This time thankfully I haven't been away from my blogging duties due to bad stuff! I was actually devoting all my time to wedding dress shopping! And I found one! Yay! I purchased my dress on Sunday and I am over the moon. I wish I could put a photo up to show you all but my fiancee checks out my blog sometimes (not that he would admit it!) so I don't want to risk him seeing it! Since Christmas is almost upon us, I decided to rock a green nail polish the other day to get into the spirit of the season. For this I went with NARS Mash. Mash is a mossy green with a gold shimmer. This polish is a gorgeous colour but it is also a total PITA to apply. Despite my best efforts I got nasty brush strokes! With that said it wore really well and after about 4 days I only had minimal tip wear. Due to my absence from the blogging community the past month, I'm really out of the loop when it comes to new nail polish collections. So I thought until I get my groove back (which will hopefully be this week!) I'd show you some of my fave colours from my collection over the next few posts. And to kick it off, I have China Glaze's Channelesque for you. Channelesque is a stunning dusty grayish purple creme. Sadly, it is a long discontinued colour but it is hands down one of my favourite nail polishes. I honestly have no complaints about this polish! It applied smoothly in two coats, didn't bubble or streak and lasted for days without a chipping! The obvious downside is that it isn't 3free. But I have to be honest, I'm not too worried about wearing this colour every now and then, even though it has some not so great chemicals in it, because it is such a stunning colour! The fantastic news is that supposedly Below Deck from the upcoming China Glaze Anchors Away collection is a dead on dupe for Channelesque! Mary from Body & Soul did a pretty convincing comparison between the two! 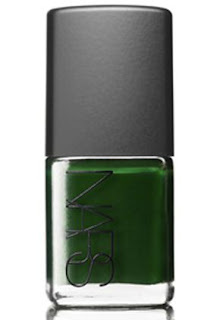 Today, however, I am wearing Pokerface which is one of the colours released with NARS' Holiday 2010 collection. Pokerface is a medium lilac with silvery lilac shimmer. Application was a little difficult. I found it to be on the thicker side and so it went on a little gluggy, but a second coat and then one coat of Poshe seemed to smooth it out fairly well. Pokerface isn't particularly unique, but the shimmer gives it a little special something. It's a really feminine lilac and I personally love the way it looks on me. Thank you so, so, so much to everyone that voted for me in the Villa Botanica honeymoon competition! I still can't believe it, but Micheal and I won the honeymoon!!!!! I honestly thought another couple had us beat, but yesterday afternoon they announced it and we were the winners!!!! Micheal and I have never won anything before (I haven't even won a nail blog giveaway! haha!) so we are over the moon! Nail Blogging Community - I really need your help!!!! 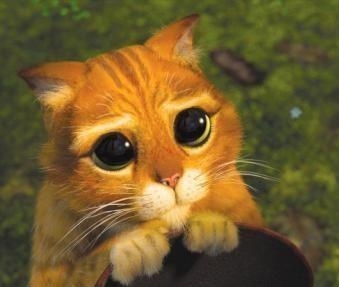 Hey everyone, I really, really need your help! If you haven't already voted, it would be greatly appreciated if you could head over to the Villa Botanica facebook page, "LIKE" the page and then write "Micheal & Carina 26/8/11" on the wall (you can only do this ONCE). If you do vote, please don't forget to leave a comment on my Lippmann Giveaway post so that it counts as an extra 5 entries for that Giveaway! (Or email me at gildednails@hotmail.com to tell me your follower name and FB name). Today I have some more colours from the Zoya Flame collection. All were three coaters, except for Valerie which only needed two coats. Despite the need for the extra coats, all these polishes applied really well. Valerie - Dark purple with pink, red and gold sparkle. This one has a distinct duochrome effect in the bottle, but it is lost a little on the nail. However, that doesn't make this polish any less spectacular. This is definitely my favourite from the collection! And to round off the post, I included another photo of Crystal.... Second time wearing Crystal and I still don't love this polish! haha! 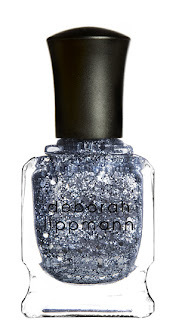 Deborah Lippmann - Waking Up In Vegas and My First Award! Hey everyone! Today I have photos of one of Deborah Lippmann's Spring 2010 polishes, Waking Up In Vegas. Lippmann isn't sold in Australia, but luckily I found it at KissandMakeupNY.com so I snapped it up straight away! WUIV is freakin awesomeness! It applied beautifully, only needed two coats and dried quickly. The colour is creamy beige-grey goodness! My nails were really long in these photos, but WUIV made them look even longer! I won't lie, Lippmann is pricey, but if you have the opportunity to get some of her colours, try this one out. You wont be disappointed. 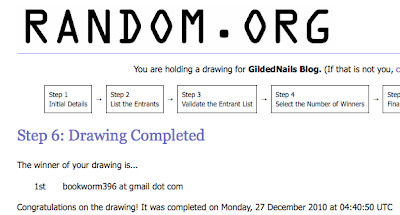 EDIT: Giveaway is now closed! Thank you to everyone who entered! Winner will be announced soon! What are the prizes you ask?! One brand new bottle of Deborah Lippmann's Today Was A Fairytale and a brand new bottle of Boom Boom Pow. Thank you all again for your support and good luck! 3. This step is completely OPTIONAL but very much appreciated!! :) For an extra 5 entries, go to the Villa Botanica facebook page, "LIKE" the page and then write "Micheal & Carina 26/8/11" on the wall (you can only do this ONCE). 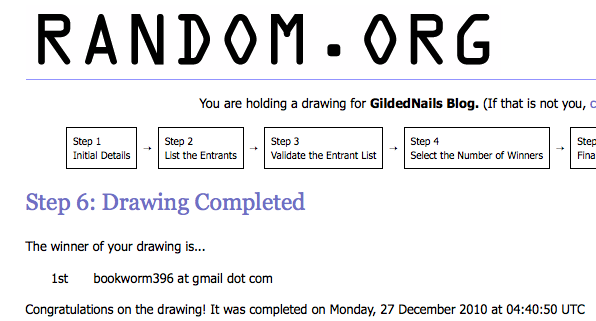 I can understand that you may not want to put a comment here telling the whole world your facebook name, so if you choose to help us out and you want the extra entries, send me an email with your facebook name and follower name to gildednails@hotmail.com so I can verify your vote :D Once the giveaway is over I will delete the emails with the names. 7. Giveaway closes on 13th November 2010. Hey everyone! I wouldn't normally do something like this but it's such a massive opportunity I had to ask for your help! The venue where my fiance & I are getting married are having an absolutely crazy competition on their facebook page where one of the couples that are booked in for a wedding can win a 5 night honeymoon in Bali at Villa Raja. As I said before, I wouldn't normally do something like this, and I still feel a little weird asking everyone... I hope I haven't overstepped the mark here and done something distasteful... :( If I have, please let me know and I will take the post down straight away.. But if you think you would be willing to help us out, then thank you soooooo sooooooo much.... We are eternally grateful for your help! I'm baaaaaack! :D Sorry for not posting over the past few days.. I have been flat out! Anyway, as I promised, I sat down tonight to do swatches of all the Models Own colours I bought at their 50% off sale.... I put the first colour on, and started snapping away and then...... my battery died.... *cries* ..........and for some reason it wont charge!!!! So I only have pics of one of the colours tonight, Lilac Dream. Lilac Dream is exactly as the name describes it - a dreamy lilac cream that glides on effortlessly! I used two thin coats and a coat of Poshe. This last photo was without flash but I feel like it gives a more true indication of the colour of this polish. I really love this colour and if it wasn't for the fact that I am dying to try the rest of the colours I got, I would probably be happy wearing this for days! I have another giveaway for everyone! I know... CRAZY! Enough dribble, on to the good stuff! Everyone has been losing their minds over the Rescue Beauty Lounge Housewives of Tudor collection, so I thought I'd give away a brand new bottle of my fave colour, Catherine H. You can check out a swatch here! EDIT: I have extended the deadline to 25th November 2010! 6. Giveaway closes midnight on 25th November 2010. And no, this giveaway hasn't been sponsored by the company! I paid for the bottle with my hard earned pesos! Punk Polish - A super neon pink. This was a little thick, and dried to a satin finish like most neons do. The finished product was quite spectacular though! One of the brightest neon pinks I have seen! Chi Chi Polish - Rosy pink glitter in a soft baby pink base. This is a really gorgeous glitter, but it definitely needs to be worn over something. This was two coats. Last week I organised to do a swap with the lovely Carli from Konad-licious for three of the new Eyeko polishes that I had been lemming for ages! I was so stoked simply about the fact that she was sending them to me! So, you can imagine how excited I was when I opened the box and found not only the three Eyekos, but all these other amazing goodies as well!!!! There are so many gorgeous polishes I wanted to try (Milani holo! *drool*) but I was instantly drawn to Eyeko's Rain Polish, so that is what I'm wearing now. 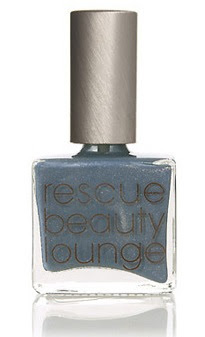 Rain Polish is a light blue grey creme with a subtle shimmer. The shimmer almost disappears on the nail but it provides just enough dimension to the polish that you don't feel like it is just another flat creme. Application was a dream. Two thins coats was plenty and it dried in a flash! Not a bad word to be said about this polish! You may have also noticed that I shortened my nails and changed the shape. I wasn't feeling the super square look anymore, so I went with the trusty squoval shape. What do you think? I was pretty happy to be getting my goodies after all this time, but the thing that got me the most excited was that my Deborah Lippmann polishes were in there! Lippmann's Across the Universe was my second biggest lemming after Fortune Teller and now that I have both, I have to say, Across the Universe is the clear winner. Across the Universe has a dark blue jelly base and is packed with green and blue hex glitter and blue regular glitter. Its fabulous!!! Check out the pic spam of Across the Universe after the jump! Today I have swatches of the three nail polishes from MAC's Venomous Villains collection. Bad Fairy - MAC describes this as a red with multi-changing red pearl, however there are definitely flashes of gold and pink. It has a distinct foil like finish on the nails as well. This was the only unique colour out of the three. As you are probably all aware, the other two are dupes for two of Orly's Cosmic FX colours. Check out Formidable! and Mean & Green after the jump! Hey everyone! Yesterday I finished my exams! After we were done, my friends and I went to a local bar and ended up staying there a little too long.... :( So I was like a bear with a sore head today! Even though I wasn't feeling 100%, it was sooooo good to be able to spend the day resting and watching TV instead of studying! Today I have the most recent collection from Rescue Beauty Lounge, Housewives of Tudor England. The collection consists of four colours named after some of the wives of King Henry VIII. Check out swatches after the jump! OPI Tease-y Does It is my second favourite Burlesque - a vampy, brownish plum colour with stacks of red micro-glitter. 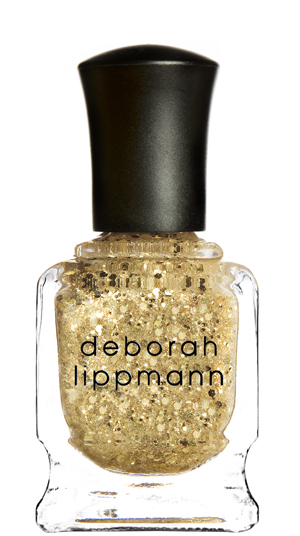 In the bottle, it has flashes of gold and looks like it could be a duochrome, but this doesn't translate to the nail. That's ok though, because this colour is glorious! Check out more pics of this beauty after the jump!